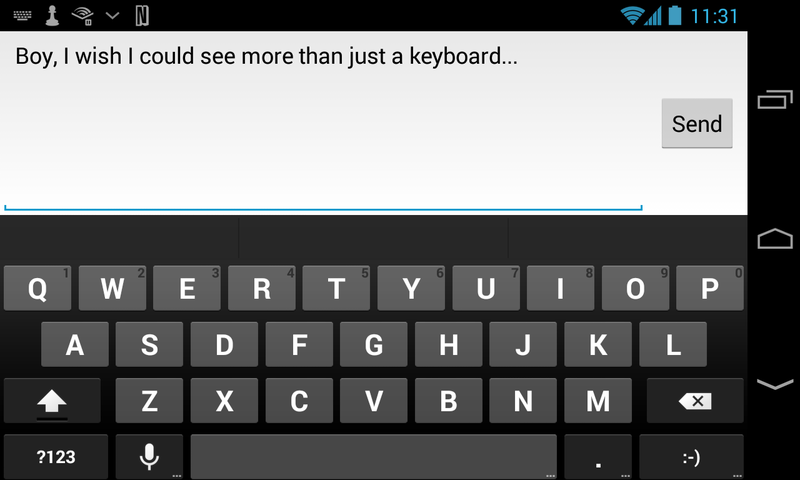 Minuum keyboard is great for keeping your screen devoted to the app you're in and not the keyboard. However it is not ideal for all times. When in portrait mode, it makes sense to have the quick, thumb ninja swipe action of Swype, Swiftkey, or the native keyboard. When in landscape, the keyboard has a bad habit of taking up the entire, freaking screen. That is where Minuum really shines. Instead of manually picking your input method like a chump, you can automate it with an app I'd like to highlight. Keyboard Manager has been around for a while, but was only available to rooted phones. The dev, ne0fhyk, rewrote and retooled the app, put it up on Play Store with a few added features, such as working with non-rooted phones. Bonus features like app specific keyboards. When switching between keyboards, a very brief dialog pops up.